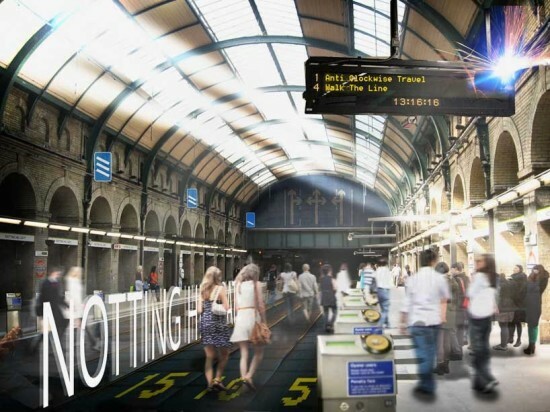 Architectural firm NBBJ has proposed a new three-lane moving sidewalk (or for the Brits, a travelator) system to replace 17-miles of the London Underground in a bid to decrease travel times and transport more people around London. Earlier this year, a plans for a London underground bike complex was ridiculed by the Guardian in its attempt to reduce congestion despite it winning best conceptual project at the London Planning Awards. With that in mind, NBBJ have boldly chosen to submit their idea which would feature three moving walkways traveling at different speeds. 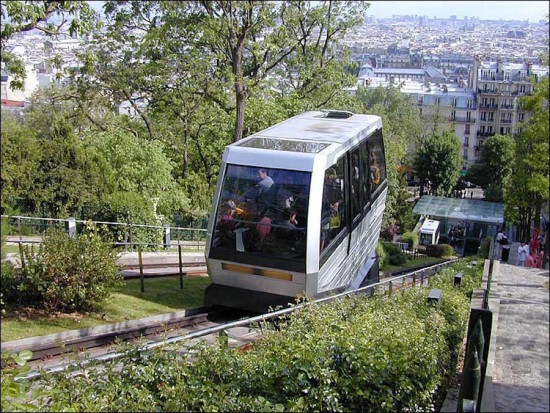 The nearest walkway to an entry platform would travel at a leisurely three miles per hour, accelerating to 9mph in lit tunnels. The project's main advantage over the current rail-based system, designers claim, is that the walkway wouldn't have to stop at the station—the ever moving track being slow enough for people to hop on and hop off. The idea could have potential to be dangerous with the sheer mass of people it aims to take on, not to mention the cost implications this would have for Transport for London. Tearing up track and making the Circle line's dark and dingy tunnels safe (let alone nice) to walk down would be no mean (or cheap) feat. Moving walkways do already exist in the London Underground system, in fact they have been present at Bank station for 55 years. NBBJ's proposal can also be seen as following on from the Trottoir roulant rapide ("fast moving walkway") at the Métro station Montparnasse-Bienvenüe in Paris. Nicknamed the "TGV," the Parisian example failed to garner success in the French capital, as the the Paris metro has had to pay out injury compensation in several cases. According to the BBC, many users of the TGV quickly ran on the moving surface despite a loudspeaker barking orders of "keep your feet flat on the ground, keep your feet flat on the ground." The failed project was replaced by a more conventional walkway in 2009. The effectiveness of travelators is also up for debate. In 2009 (a bad year for travelators it seems) the Daily Telegraph reported that research about moving walkways in airports indicated they actually slowed people down and that the time advantage was minimal. NBBJ still advocates the health benefits of walking between stations that such a moving walkway system might provide. Ironically, there are few surer ways to emerge from obscurity than to be hired by Kanye West. 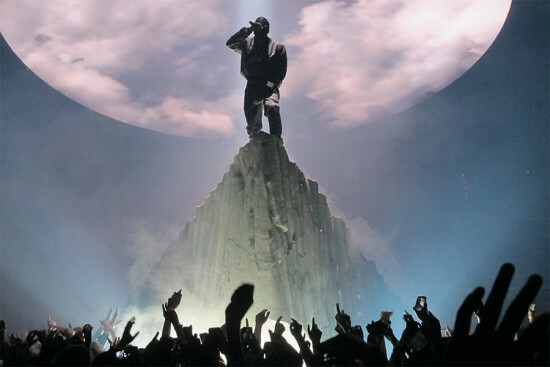 For Romanian architect Oana Stanescu, who designed a 50-foot stage-prop volcano for the rapper’s Yeezus tour, it meant finding a way to reconcile pop culture with utilitarian design. Stanescu and her partner Dong Ping-Wong, of New York–based design firm Family, recently completed the Hong Kong flagship store of Off White, a high-end streetwear brand founded by Virgil Abloh, West’s creative director. In a recent interview with the New York Times, Stanescu declined to reveal what other Yeezus-related projects are forthcoming, but she was reportedly hired to baby-proof and redesign the 9,000 square-foot, faux-French-Italian Los Angeles mansion the rapper shares with wife Kim Kardashian and daughter North West. As one of the designers behind the Kickstarter-backed +Pool project, which seeks to install a floating pool in the East River, Stanescu is persistently, if inadvertently, in the public eye. When queried about her name being dropped by the gossip tabloids after she designed West’s volcano, she pragmatically told the New York Times, “Design is at its best when it’s collaborative. I’m interested in pushing the boundaries of what architecture can do.” West made an appearance at +Pool’s Fall Swim Benefit in at Jane’s Carousel in Dumbo to support Stanescu’s project, set to be the world’s first water-filtering pool when it opens in 2017. The plus-shaped pool can reportedly clean 500,000 gallons or river water per day. Meanwhile, Stanescu has been photographed accompanying West on architectural field trips to seek inspiration for his pared-down Paris home, where she is adding a baby room. But she is not the only top designer West has consorted with—the rapper has also consulted household names Dirand, Vervoordt and Tristan Auer, neglecting an unspoken competitive code of conduct in the design world. “Right now Kanye is just sponging things up, observing how these people work,” Stanescu told W magazine. The architect first met West when he hired Rem Koolhaas’ Office of Metropolitan Architecture, where Stanescu used to work, to design a viewing pavilion for his short film Cruel Summer at the Cannes Film Festival 2012. 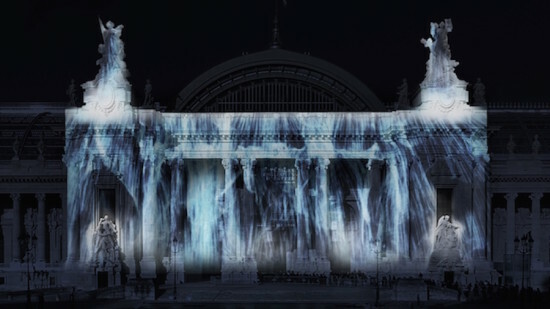 Recently, Paris’ Grand Palais was awash in the cascade of a virtual waterfall, transforming the beaux-arts palace into a captivating scene from the lost city of Atlantis. TeamLab, a Japanese collective of technologists and artists, used 3D projection mapping to create the holographic play of light and shadow, while maintaining a fidelity to the laws of physics. The artists calculated the movement of the waterfall by creating a 3D model of the Grand Palais des Champs-Élysées in a virtual computer environment and allowing water to cascade over it. “The water is expressed as continuum of hundreds of thousand of water particles that flow in accordance with how the computer calculates the interaction of the particles,” teamLab explained in a post on its website. “Once an accurate water flow simulation has been constructed, 0.1 percent of the water particles are selected and lines drawn in relation to them. The waterfall is expressed as the combination of these lines.” The torrents of water fall with arresting slowness and are deflected as they “collide” with the silent statues and columns of the magnificent building. TeamLab, the brains behind Tokyo’s interactive hanging gardens and LED Christmas trees, programmed a slight time lag into the cascade as a nod to their Japanese ancestors, who perceived time and space as “on a longer axis.” The artists allege that only if one “does not feel a barrier between them and the waterfall,” or, in other words, cedes their full attention, can the viewer truly experience the artwork’s underlying intent. The projection mapping light show was created as part of the Art Paris Art Fair 2015. It’s serious crunch time in France for environmental policymaking as regulations tighten in deference to the 2020 goal of reducing carbon emissions by 25 percent. Paris is also scrambling for brownie points as it prepares to host the UN Conference on Climate Change this November. Lawmakers in France recently decreed that all rooftops of new commercial buildings must be covered in either plants or solar panels. Other major cities have gone to similarly stringent lengths, with the city of Toronto, Canada, mandating green roofs on all new buildings in 2009—whether residential, industrial or commercial. Expected foliage cover ranges from 20 to 60 percent depending on the size and type of building, with residential dwellings less than six stories high exempt from the mandate. Green roofs are an apt counterweight to the urban island phenomenon, in which urban zones are found to be several degrees hotter than surrounding rural areas because of their concrete density relative to moist, permeable land and vegetation. On the other hand, green roofs create an “isolating effect” that cools the building, reducing energy needs for heating and cooling in winter and summer, and retain rainwater to reduce excess runoff and flood likelihood. A green roof also bodes $200,000 in savings over its lifetime, according to researchers at Michigan State University. French environmental activists had initially lobbied for far less leniency, calling for every roof on every new building to be entirely covered by plants, without the option of installing solar panels instead. The Socialist government sought a middle-ground appeasement, convincing activists to limit the law to commercial buildings. France still lags behind other European countries in terms of solar deployment, installing just 613 megawatts of solar photovoltaics in 2013, falling behind countries that had installed at least 1 gigawatt in previous years, according to a 2014 report by the European Photovoltaic Industry Association. 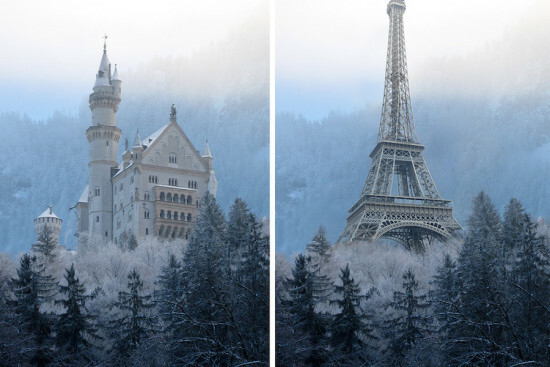 When it comes to a famous landmark, to what extent does locale add to its majesty? An inventive design competition posted to Australian virtual design studio DesignCrowd explored this question with a challenge to designers to reposition the world’s most hyped monuments in all-new locations using high-resolution images. Designers were tasked with making the extrication of the Big Ben look believable, inserting in its place the Sydney Opera House, the Eiffel Tower, or the Great Wall of China. The first-place accolade went to a Photoshop-aholic who had supplanted Moscow’s St. Basil’s Cathedral in place of the Great Pyramid of Giza in Egypt. Snagging second place was a seamless overlay of the Roman Colosseum where the Sydney Opera House had once stood. Meanwhile, another designer made the Sydney Opera House seem a natural addition to the Thames riverfront overlooked by the London Eye. Another creative effort saw the Hollywood sign superimposed on the hills along which the Great Wall of China undulates. The design brief, posted to the crowdsourced graphic design bidding site, received 92 designs from 25 designers. In keeping with Paris’ mounting aversion to automobiles, Mayor Anne Hidalgo recently announced plans to bar motorists from the banks of the River Seine by summer 2016. This latest blow to motorists occurs in tandem with the all-or-nothing anti-pollution target Hidalgo set last year of banning all non-electric or hybrid vehicles from Paris’ most polluted streets by 2020. 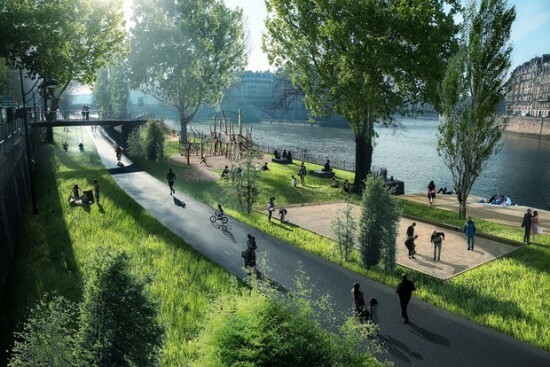 Renderings for the futuristic River Seine project a motor-free parkland consisting of a tree-shaded promenade with space for children’s playgrounds and sports facilities. The length of this promenade is TBD, with some proposals occupying a modest 0.9 miles, while others insist on a 2.05-mile car-free quayside, potentially freeing up 1.4 acres of parkland. “All of this is part of a comprehensive policy in which we assume very deliberately that there will be fewer cars in Paris,” Hidalgo told reporters at a press conference. “Therefore, in calculating the flow of spillover traffic I don’t project myself into a world where there are as many cars as today. Objectively, that will no longer be the case.” The Seine has a distinctive double-tiered embankment that has allowed it to moonlight as a motorists’ artery into the city center without detracting from the romance of the riverscape. The upper embankment sits at street level, and has remained a scenic promenade dotted with quaint booksellers’ stalls. The lower embankment, where the roads traverse, is at water level and is sunken below high walls, with sections of road encased in tunnels. The City of Paris began reclaiming the Seine in 2002 under the "Paris Plages" program, when it closed down sections of the quayside to create a temporary summer beach complete with real sand and sun loungers. In 2013, the city barred cars permanently from a long stretch of the Left Bank to create a waterside park. According to the mayor, the city’s slow assail on motorways is part of “an urban, almost philosophical project which consists of seeing the city in another way than through the use of cars.” In Hidalgo's car-cutting schemes along the Seine are also architected toward freeing up the Georges Pompidou Highway on the North side, part of a UNESCO World Heritage Site. 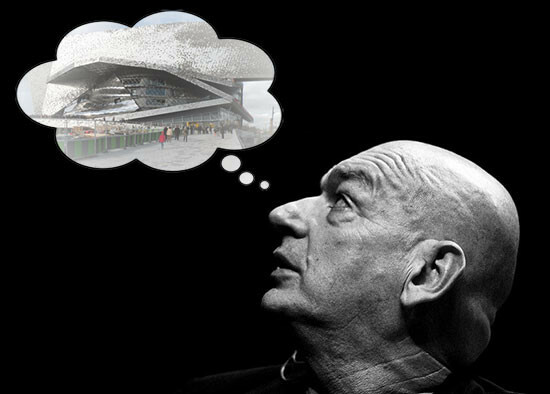 Celebrated French architect Jean Nouvel lost a court case in which he sued the Philharmonie de Paris for removal of his name from the project due to major deviations from his original design. The court, which ruled in his favor on April 16 pending “additional detailed and comparative information,” reversed its decision hours later. The jury alleges that Nouvel failed to provide incriminating documentation to justify his claim that 26 parts of the 2,400-seat auditorium, whose January 15 inauguration he boycotted, had strayed from his design. These key elements include parapets, foyers, facades, promenades, and acoustic elements of the performance hall. 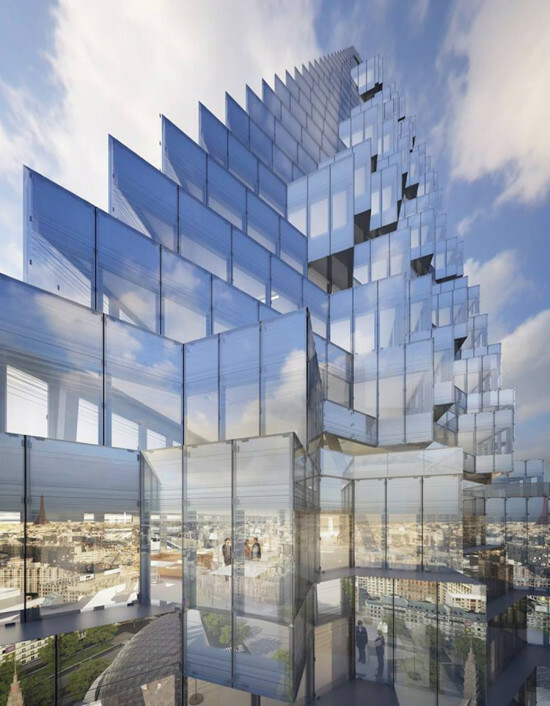 The court said the documents he provided "do not allow the court to assess the work asked for in its definitive state, both globally and in detail," and the court was thus unable to rule whether the work had been "adulterated.” Nouvel also sued on the grounds that his firm, Ateliers Jean Nouvel, was not liable for the nearly doubled costs due to delays and allegedly radical departure from the design proposal. The power grid of the future may consist entirely of trees—and we don’t mean biofuel. 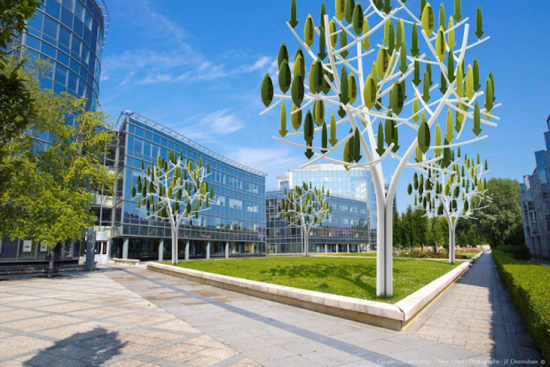 French R&D company New Wind recently pioneered the “wind tree,” a wind turbine that is both silent and soothing to behold. While wind turbines are ordinarily thought to be noisy and unsightly, the “Arbre à vent” developed by French entrepreneur Jerôme Michaud-Larivière resembles modern art’s sculptural interpretation of a tree. The biomorphically-inspired contraption features 72 electricity-generating leaves oriented vertically along a white steel frame approximating tree branches. Made of lightweight plastic treated with element-resistant resin, the leaves can harness winds as light as 4.4 miles per hour, enabling the turbine to continue generating power for 280 days per year, factoring in climate vacillations. Despite this keen sensitivity, the turbine is designed to withstand Category 3 gusts (wind speeds of up to 129 miles per hour). At 26-by-36 feet the “wind tree” is no taller than the average tree, and camouflages with the landscape instead of being a looming presence. Each rotating leaf contains a generator with a capacity of 3.1 kilowatts of electricity—a modest amount, but a streetscape lined with wind trees could rack up enough juice to power all nearby street lights or a small apartment, according to EarthTechling. The circuitry is wired in parallel and each generator is sealed in protective casing so that the breakdown of one leaf does not gum the system. Meanwhile, the company is replicating the plant-inspired design template in a scaled-down "wind bush" currently in the works and "foliage" as a wind power catch-all on rooftops and balconies and along roadsides to power variable-message signs. From May through the following March, a demonstrator tree will be installed at the Place de la Concorde in Paris, a major public square, to introduce it to the general public, after which 40 more wind trees will be installed around the country. While prototypes have been installed on select private properties, the item will not be mass produced until summer 2016, and even then will be available only in France and nearby European countries. Each wind tree is slated to retail for approximately $36,500 apiece—slightly more expensive than the traditional 10-kilowatt turbine, which costs an average of $30,000 including installation. Paris’ stringent urbanism laws triumphed yesterday in the city council’s vote to reject plans to build what would be the third tallest skyscraper in the city and the first such towering structure in over four decades. A breach of the secret ballot terms, however, has prompted socialist Mayor Anne Hidalgo to reject the vote after it came to light that opposition council members had revealed their decisions, with one official later tweeting a picture of himself brazenly holding his yellow ballot up in the air. “The law has not been respected,” said Hidalgo, who plans to present the matter to an administrative court. 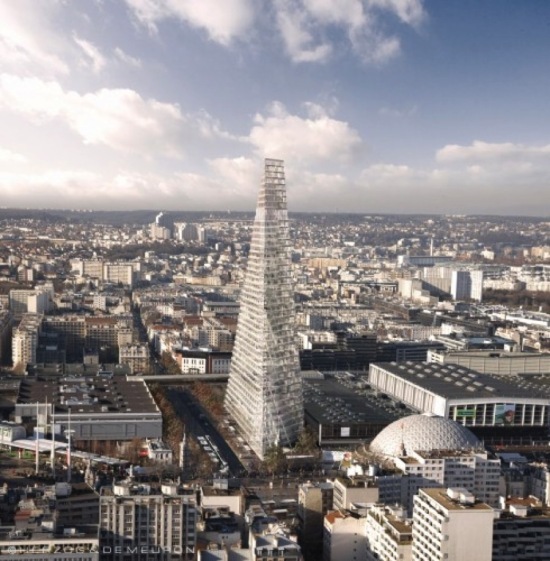 The proposed glass, pyramidal shaped building, designed by Herzog and de Meuron, would rise up to 590 feet in the 15th arrondissement, and become the third tallest after the Eiffel Tower (1,0653 ft) and the Montparnasse tower (686 ft). 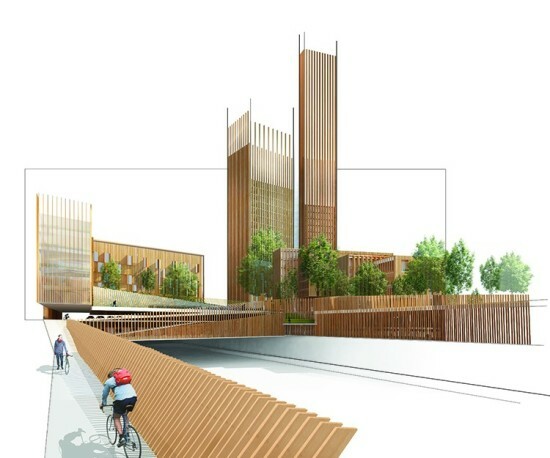 Those in favor of the so-called Tour Triangle argue that it will create 3,000 construction jobs and economic activity. The controversy surrounding the decision epitomizes the ongoing struggle plaguing new development in Paris: Whether architecture should be contextual to fit within the scale of the historic city or push the bounds. From this decision, it will likely be a slow march towards the latter. French architecture firm H20 Architectes has given light to a nursery school sited in an unusually tight and narrow courtyard site in Paris. Located in the shadow of surrounding buildings, the new facility has been designed with a glass facade and corresponding shade canopy that appears to lift effortlessly at the front entrance, belying its rigid construction. 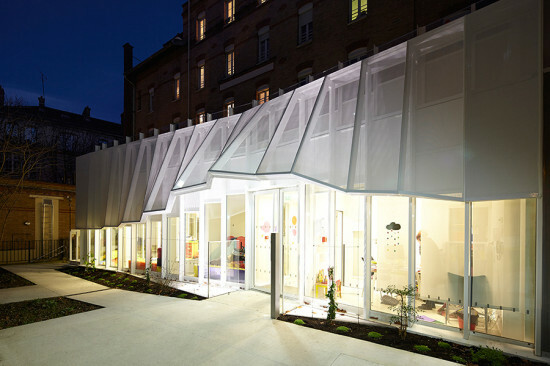 The extension and renovation of Epée de Bois nursery school in Paris, which opened this year, has provided an airy space for 24 children and features a rooftop play area guarded by the crimped and undulating shade screen along the structure's parapet. The new envelope will let light penetrate into the interior of the preschool while achieving high energy performance. The facility is built on three levels including its basement—two for children and one for offices—and the roof terrace has been imagined as an open playground enclosed by glass panes. "The extension of the nursery is an opportunity to give new coherence to the group of buildings," H20 Architects said in a statement.